Father Gabriel Strobl (1846 – 1925), a dipterist of worldwide renown, spent most of his active scientific life as a priest and professor of natural science in the Benedictine monastery of Admont, a small town in the Styrian Alps of Austria. Between 1880 and 1910 he published some 50 papers, dealing mostly with the Alpine and south European (mostly Spanish) Diptera. He built up a celebrated Natural History Museum in the Benedictine monastery in Admont, and in particular an important scientific collection of Diptera that comprised more then 50,000 specimens of Diptera. 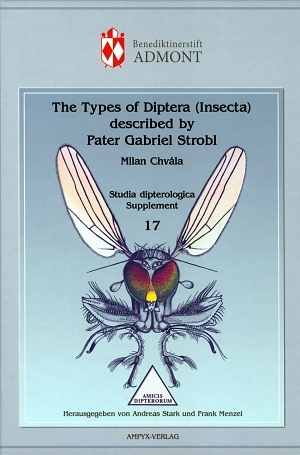 Gabriel Strobl described a total of 902 new Diptera species-group names (species, varieties or forms), which are revised and discussed in the present monograph. This publication gives details on all the type specimens housed in the Strobl Diptera Collection in Admont, their type-status, their designations and identifications, and also gives information on the possible location in other museums and institutions of type specimens that have not been found in the Strobl Collection in Admont. This book conforms to the EU and ICZN recommendations to publicise precise evidence about the location of all animal types. It is a publication that follows in the footsteps of previously published revisions of the type-material of Diptera published by A. C. Pont (1995) on the British dipterists G. H. Verrall and J. E. Collin, and by H. de Jong (2000) on the Dutch dipterist J. C. H. de Meijere. The introduction to this publication also provides details on the history and significance of the Benedictine monastery in Admont for studies of natural history in Europe from the time of the Middle Ages to the present, as well as the recent history of the Natural History Museum in Admont. A brief biography of Gabriel Strobl and his significance for dipterology and for science in general is also given. Appendix C: List of taxa named after Gabriel Strobl.